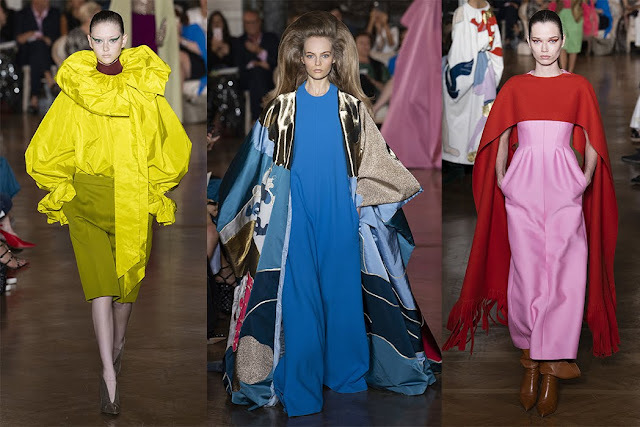 If it’s Paris in the Summer, then it’s time for the Fall Haute Couture collections. It’s a challenge to untangle the seasons. Summer 2018 is the time to see the latest Fall 2018 custom-made couture. But at the same time, the men’s collections for Spring 2019 are being shown in Milan and Paris. Some shows are unisex and include womenswear for Spring 2019. That means that the Haute Couture for Spring 2019 will be shown in January of 2019. Confusing? You betcha. 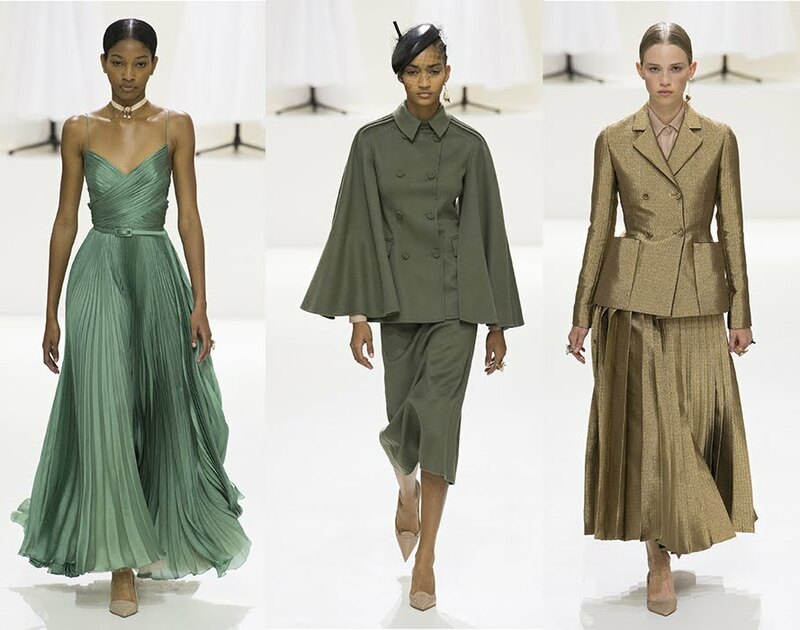 Because the Haute Couture collections are truly fast fashion, custom-made for instant consumption by rich private clients and magazine editorials, the designers often offer genuine, fresh-off-the-runway newsmaking originals. The most important, influential couturiers are all agreed that a new mood is in the air. The best designers are sensing a seismic shift from crazy showstoppers to chic statements that are deluxe, discreet and dignified. The new Duchess of Sussex may well become the role model for the new mood. 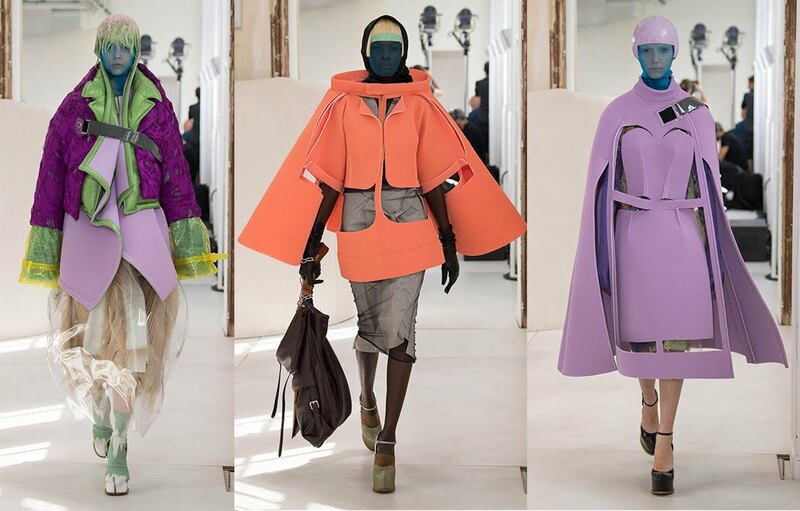 Oh, there are still creators like John Galliano at Martin Margiela who aim to shock and/or bewilder. But the more serious leaders are forging a pathway with wearable, adult, elegant, super-sophisticated, simple styles. Fabrics are as costly as expected at couture level and dressmaking skills are tantamount. Black is important but there are some saturated mid-tones that look directional. KARL LAGERFELD for CHANEL is still going strong, updating the iconic brand yet again. This season’s reinvention is unfortunately not very flattering; a clunky, boxy shape with gimmicky zippers that unzip to show micro-miniskirts or fluted sleeves that reveal crushed chiffon gussets. The expected tweeds are present, but they seem too heavy. Lagerfeld says he was inspired by urbane Paris, by the cool grays and greige of the buildings, but a more accurate metaphor might be the heavy-handed Brutalist architecture of the ‘70s. ARMANI PRIVE by GIORGIO ARMANI sticks to his tried and true formula. Pure luxury, subtly stated. Impeccably tailored jackets and slender, wand-like gowns in restrained good taste. The fabrics are extravagant and the color palette is based on black and champagne. MARIA GRAZIA CHIURI at CHRISTIAN DIOR obviously feels that fashionable clothes are serious, very serious. 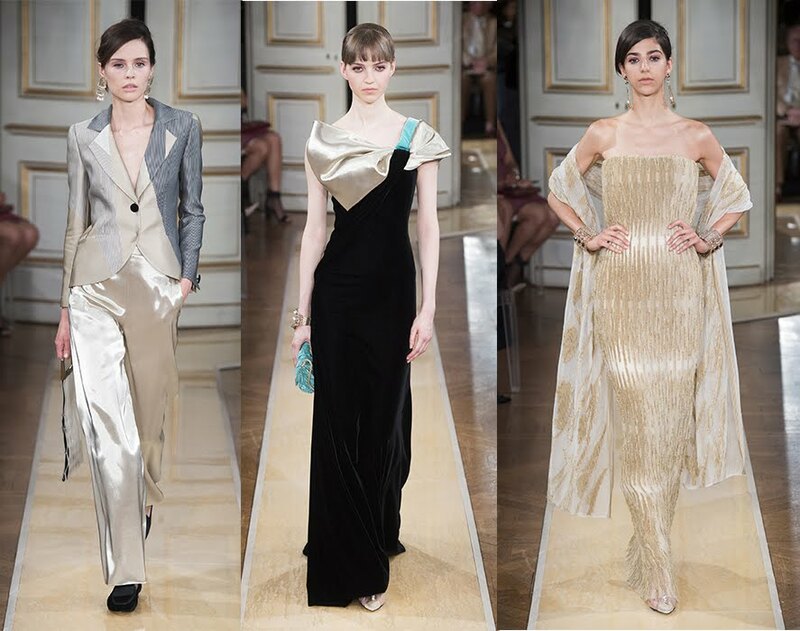 Her collection references the label’s rich heritage and utilized one of the finest alteliers in all of Paris. Meticulous tailoring by talented crafters allow the realization of the designer’s quest for perfection. Nothing but low-key high impact drama. PIERPAOLO PICCIOLI for VALENTINO’s triumphant collection cannot be boiled down to any one trend. It is a mash-up of divergent sources including: Greek myths, Pasolini films, Ziggy Stardust, armor, 17th and 18th century paintings, photographer Deborah Turbeville. Somehow, it all works. 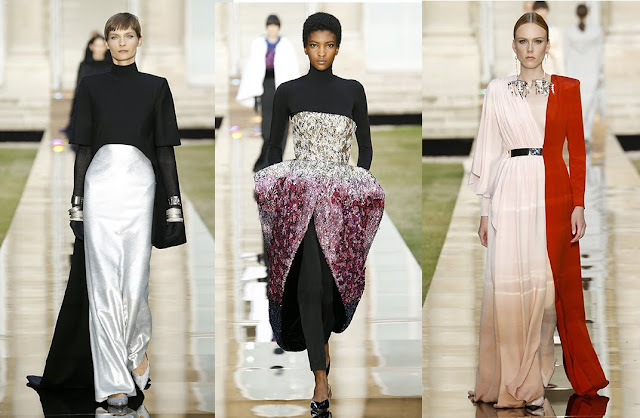 An extravagantly strong statement of how wonderful haute couture can be. FENDI is all about furs, but furs are out of favor. Gucci, Micheal Kors and Versace have all recently forsaken furs. What’s a furrier to do? Create fabrics that look like fur (for example, fringed tulle that looks like mink.) 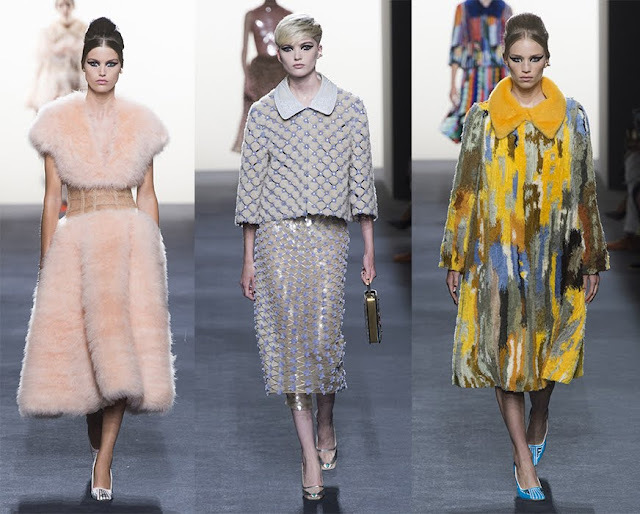 Easier still, Fendi’s collection features fabulous fashions made in non-fur materials. 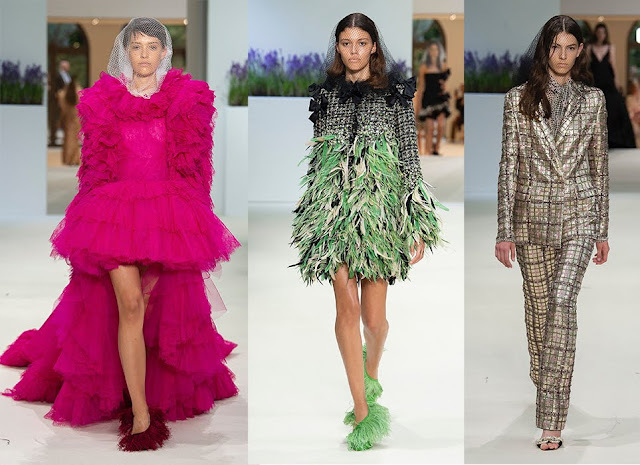 GIAMBATTISTA VALLI is catering to a young couture customer with collections that would be perfect for a real-life Barbie doll. Some sky-high hemlines are sometimes long in the back. The collection is sweetly pretty partywear, a confectionary no-brainer of fancy gowns, frocks and pantsuits. 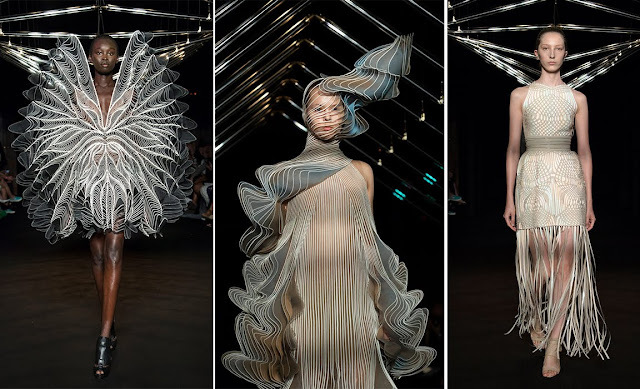 IRIS VAN HERPEN continues to follow her own glorious path, creating wearable art. This season she is inspired by feathers, by the wings of birds and the sound waves created by birds in flight. Her inspiration comes to fruition as breathtaking visions of futuristic fashion that is truly original. Will she ever become commercial? Unlikely. Will the fashion world ever catch up to her? Even more unlikely. Eco authorities state that by 2100 the world’s temperatures will have risen 3.2 degrees, melting the ice caps and affecting 3 billion people living in submerging coastal megacities rising skyward right now. Global disaster! Fashion to the rescue? 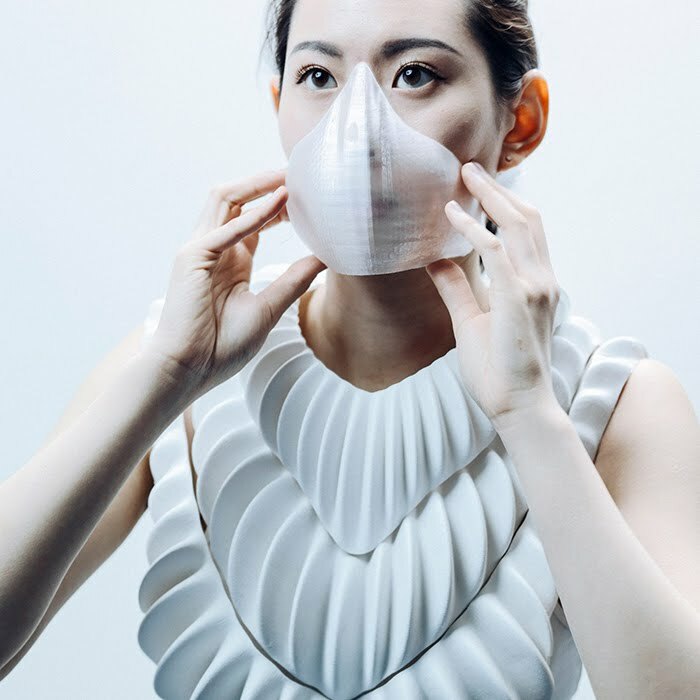 Jun Kamei a student at the Royal Academy of Art has come up with “Amphibio,” a two-part, 3D printed apparatus/accessory that would enable modern mermaids to breathe underwater. It extracts oxygen from water and releases carbon dioxide back into it. Until such time passes, mermaids are a recurring fantasy and part of Pop Culture in movies like Mr. Peabody and the Mermaid and The Glass-Bottom Boat, both included in out-of-print paper doll books. 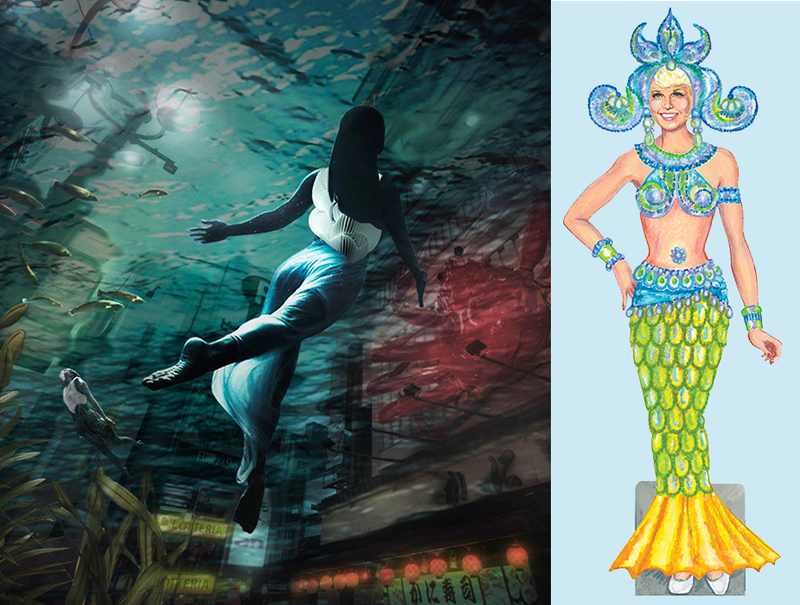 (Captions… 28…RCA student Jun Kamei’s apparatus/accessories for breathing underwater 29.30…Fantasy image and Doris Day’s mermaid costume in The Glass Bottom Boat. 31,32…Mr. Peabody and the Mermaid, Ann Blyth’s costume in vintage paper doll book, 1952. RCA student Jun Kamei's apparatus/accessories for breathing underwater. 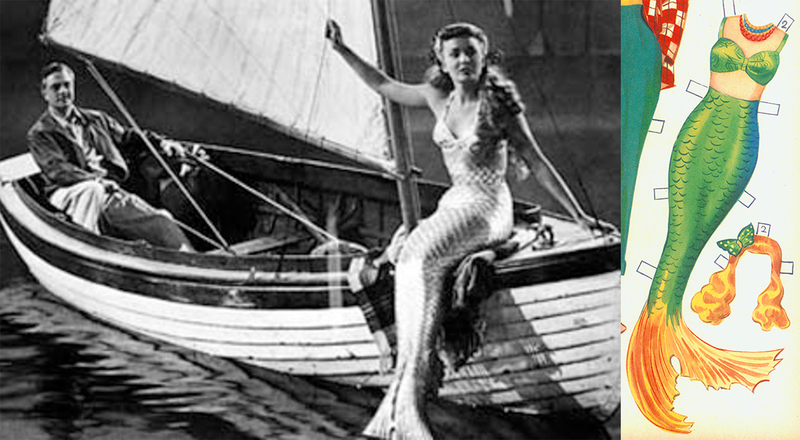 Fantasy image and Doris Day’s mermaid costume in The Glass Bottom Boat. Mr. Peabody and the Mermaid, Ann Blyth’s costume in vintage paper doll book, 1952. When I saw this new Royal Wedding coloring book, I eagerly bought it and was very disappointed. Where’s the bridal gown? Not in this 30 page book that obviously was created before the gown was seen. The book is filled with wedding-related still-life drawings and a few, very few drawings of the Royal couple, mostly commemorative. What a missed opportunity for illustrator Teresa Goodridge to show the new Duchess of Sussex as she steps into the media spotlight, stunning in an elegant, simple bridal gown. And it seems she has a new wardrobe that exemplifies fashion’s incoming sophisticated trend. I’m hoping this is just the beginning of a stunning image for this lovely new member of the Royal Windsor family. 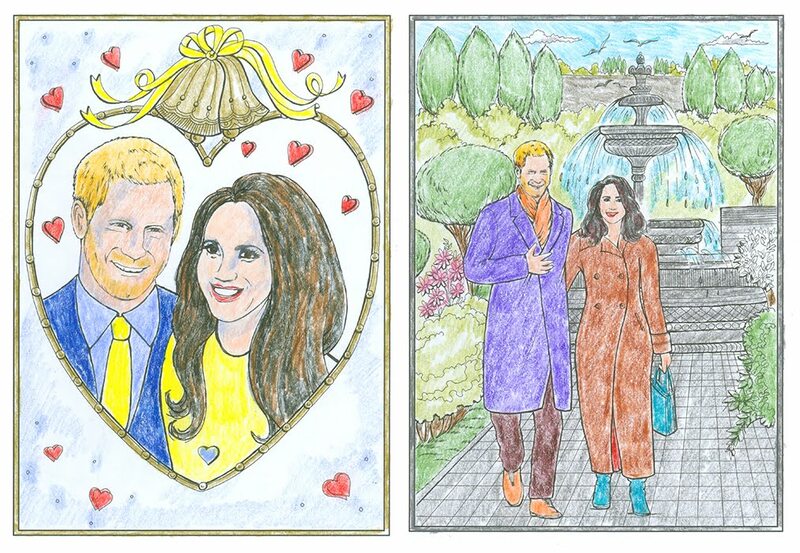 Even though it is missing Meghan’s fashion statement, the coloring book is definitely collectible. Published by Dover Publications, $9.99. 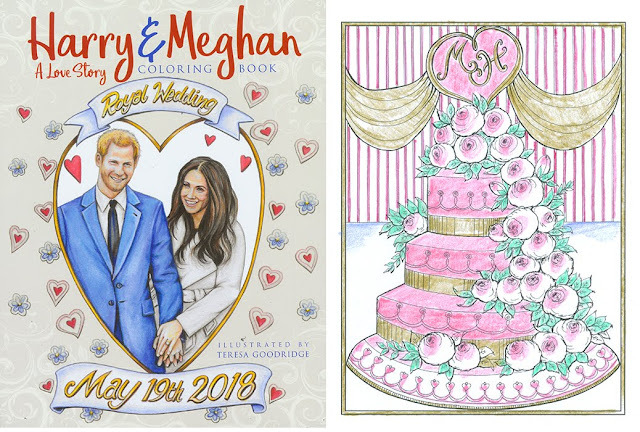 Harry & Meghan Coloring book cover and still life page. Coloring book pages colored by me. 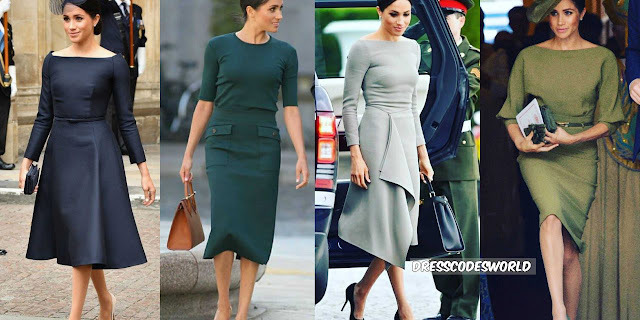 Meghan’s elegant, simple sophisticated wardrobe may very well become trend-setting.